If you are like me, you probably spend quite a bit of time in front of your computer. 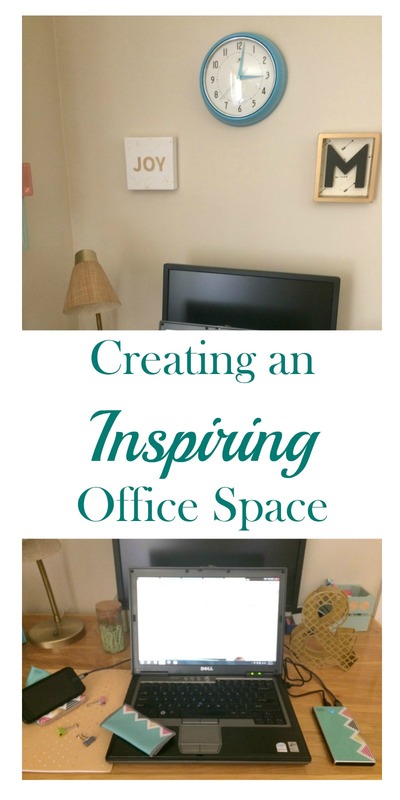 Because of this, I want my office space to be organized, functional, and inspiring. You may remember I stole a corner of our Living Room to create an office nook several months ago. Now that I have been working there for a while, I have made a few changes to the original space to make it more inspiring and functional. I moved the vinyl wall decor from above my desk to above the cork board. It seemed to fit a little better. 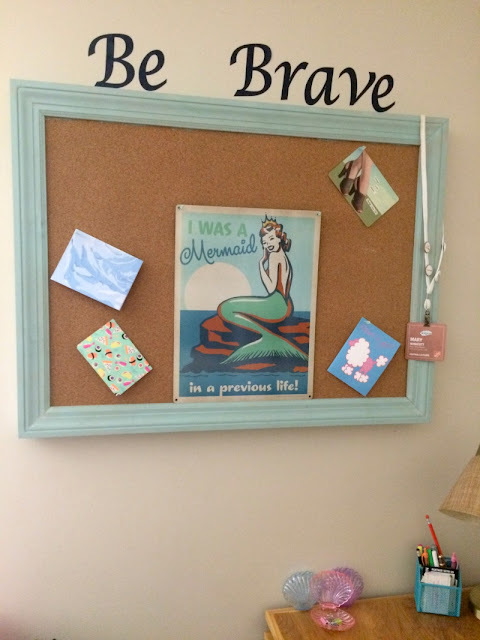 On my cork board, I hung the mermaid sign my hubby got me for Christmas, along with a few notes of encouragement from friends. 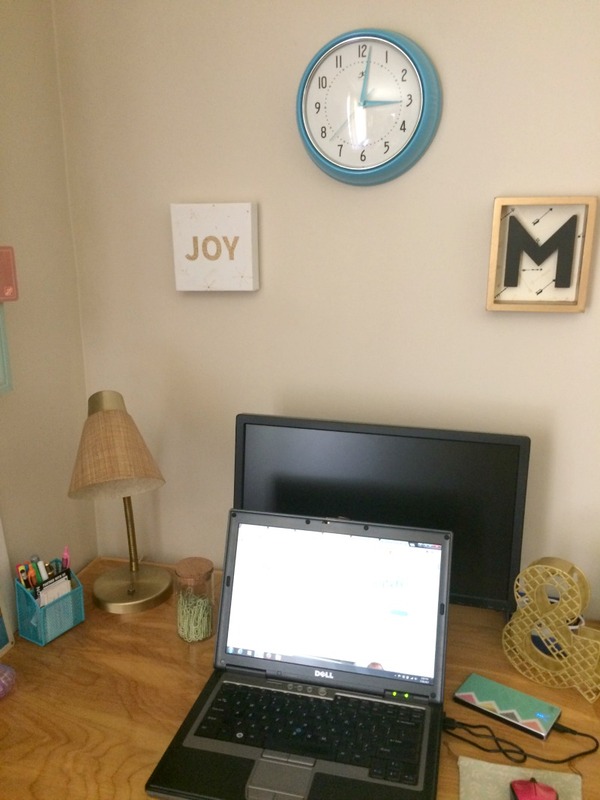 I also hung a couple of pieces of wall decor I found for a few bucks at TJ Maxx above my desk. The "M" is obviously for my name and "Joy" is my word for this year. It reminds me to find joy in the things I am doing. 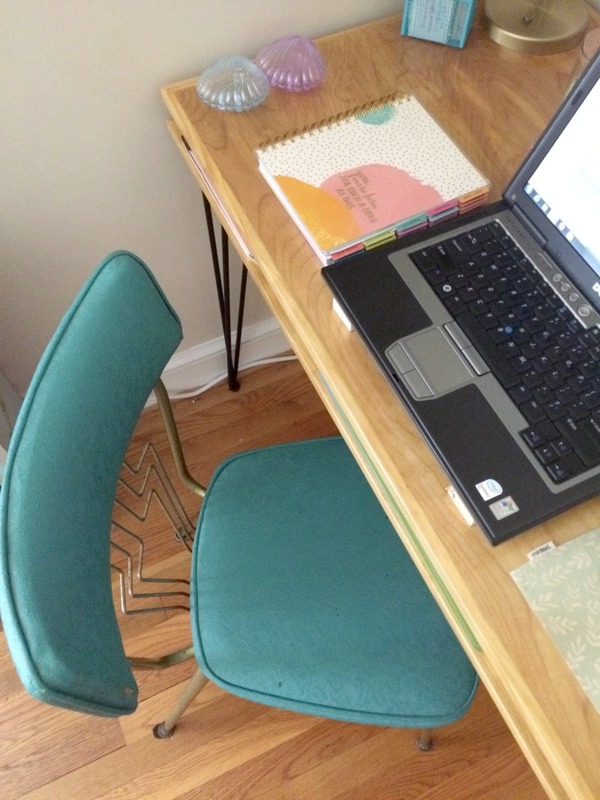 You should also add quirky and/or colorful pieces to make the space fun, like this retro kitchen chair in turquoise (of course!) 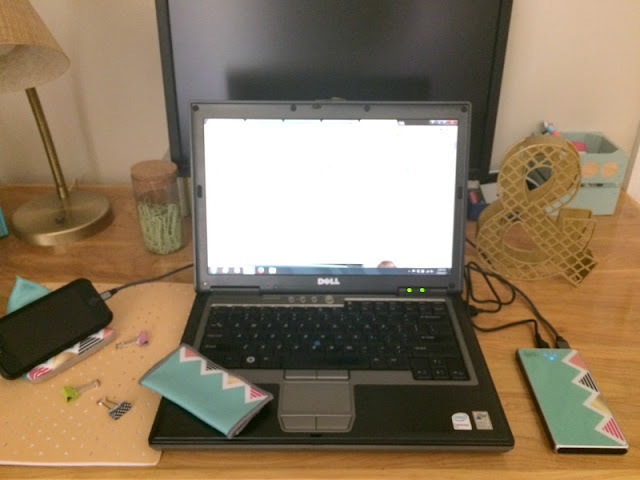 A bright planner keeps me organized with both my personal life and blog calendar. 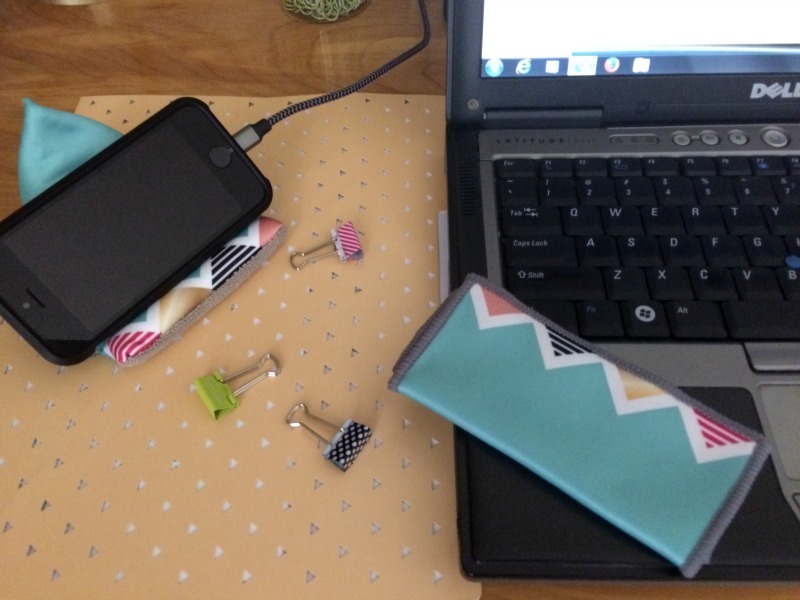 Those cute little plastic shells were sent to me by my Instagram friend, Jessica and are perfect for holding small supplies, like mini binder clips and paper clips. I also love pretty file cabinets. This picture is actually from my friend's office, but I want to do this to a file cabinet I picked up at a thrift store a few years back. 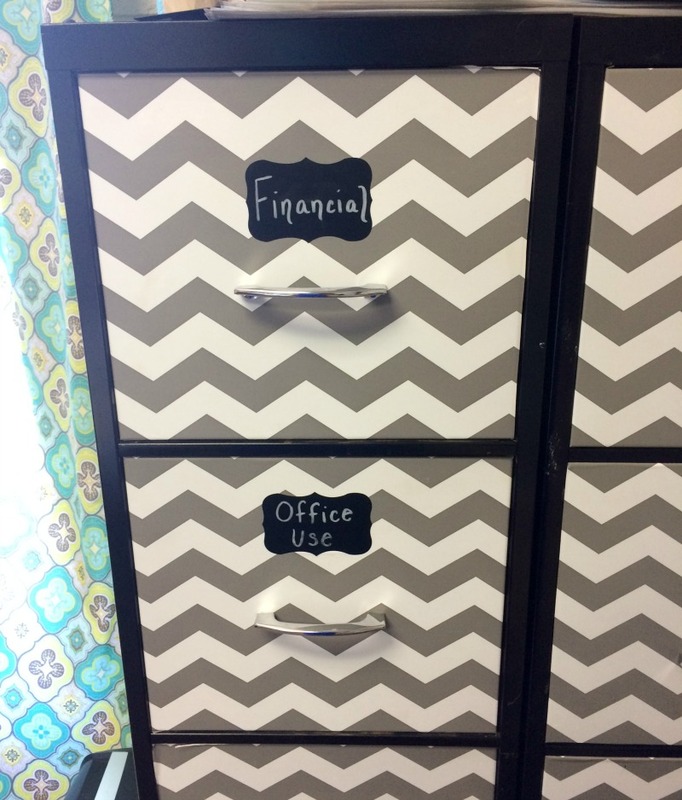 She used contact paper and chalkboard stickers...easy peasy! I also added a couple of tech accessories from Toddy Gear (in my favorite color, of course) to my desk area. I also received a wedge stand for my phone and a microfiber Smart Cloth that is perfect for cleaning everything from my phone screen, to glasses, and even my camera lens! 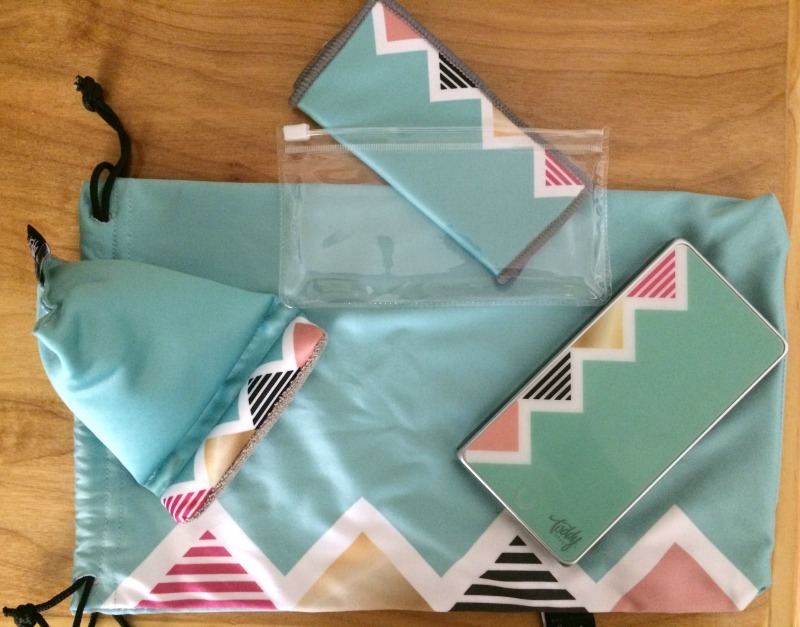 You may as well have your tech accessories match your style, since you need them anyway! Toddy has tons of designs and also does personalized customization too! 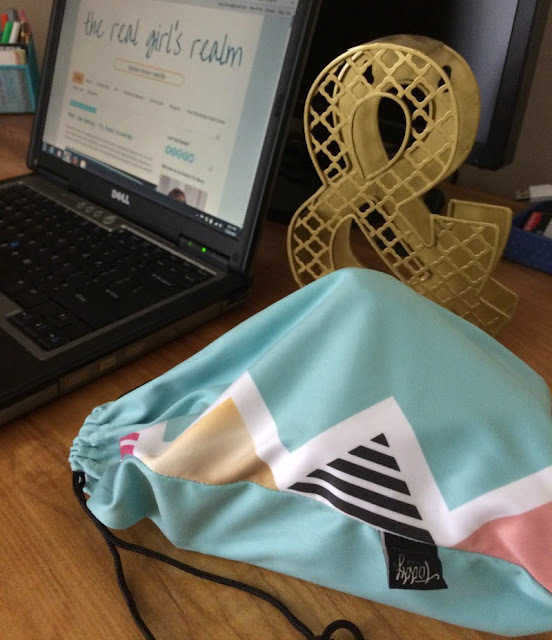 They also come in this handy drawstring bag so you can easily throw them in your purse or laptop bag when on the go! To learn more about these products and the rest of their line, check out Toddy Gear online and on Instagram, Twitter, and Facebook! In addition to offering you guys a 20% off discount code (REALGIRLS20) on your purchase, I also have a chance for you to win a Smart Charge Deluxe in your choice of designs! Disclosure: The product in the post was provided to me, but all thoughts are 100% my own. I need to start carrying a portable charger with me when I'm out for an entire day. These products are so stylish! I love that frame and the mermaid sign your husband got you. Thanks! I love all the coordinated designs too! An inspiring space is a must for creating! Love this! I would pick the deep woods design! They have so many fun ones. I like the FLOWER POWER BLUE design. There are so many cute ones to choose from though! I might pick the FIERCE SMART CHARGE POWER BANK if I won. I like the Steel Will Smart Charge Deluxe. They have some really awesome designs for their power banks. I like the RADIANT CABLE. I really like the shark ~ Fierce Smart Charge Power Bank. I like the WATER LILLIES SMART CHARGE POWER BANK. I love the Meow Smart charge! I like the flower power design. I like the storybook design! Starry Night Smart Charge Power Bank would be a top pick. OMG I love the aquastripes phone charger! It is so cute. What a great post about making my little office space better. Thank you! My 12 year old and I really like the Jazzy . they really have some cute designs. I like the Deep Woods or the floral designs. I would pick Pug Life. I love pugs! After visiting Toddy I thought the Facets Pocket Toddy is a very awesome pattern. I would like the Meow Smart charge! The Starry Night design would be what I would want. My wife would love to have the cool Lots of Love Smart Charge Power Bank use everyday. A fascinating Slothing Around Smart Charge Power Bank, my wife wants to use, would be an amazing gift. My lady friend likes smart designs, and the Fierce Smart Charge Power Bank would be marvelous to have for all occasions. I would really like to use the nice Flower Power Smart Charge Power Bank, and it would be a wonderful item, too. A captivating Polka Cherry Smart Charge Power Bank, as a fabulous gift for my girlfriend to have, would be just great. 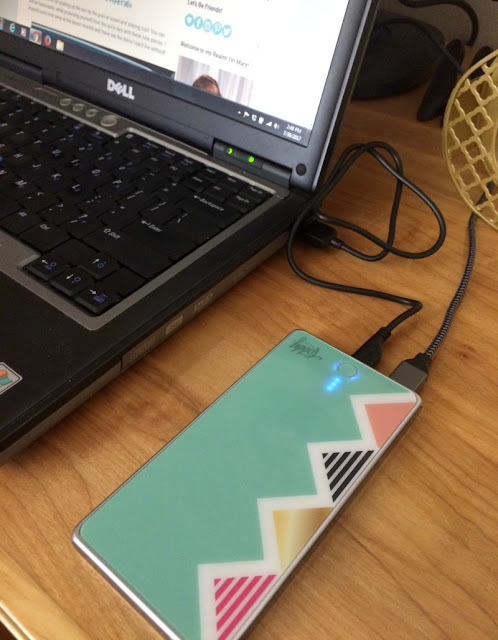 The awesome Aqua Stripes Smart Charge Power Bank is a prize, that is just right, for the day and my wife.